At the K9 Clubhouse we share in your passion to provide your dog with the healthiest diet. It's not just dog food. We believe in creating healthy, wholesome meals that will lead to a longer, healthier life for your dog. A balanced meal with quality ingredients is key to ensuring that your dogs meals are nutritious and safe to eat. Meet with our Canine Nutritional Consultant to get you started on your dog's journey to a more balanced life! Our nutritional consultant can evaluate any concerns you might have with your pet’s current diet, and help you bullet proof the way you feed your best friend. - 1-hour one on one time with nutritional consultant. - Session is in office or skype. -Full Access to "Fort McMurray Raw Feeders Club” on Facebook, which is a private online community of personal clients of Mary, where you can find answers, continue to learn new things and ask important questions. -Interested in switching to raw. -If your currently raw feeding, but want to be confident. -Looking for advice on ageing pets or puppy feeding. -Looking for professional advice on how to be proactive with whole foods and supplementation. This consultation is a two separate, one-hour private session to discuss your animal’s personal nutritional needs. Your concerns will be addressed by our nutritional consultant, she will work with you to come up with a healthy dietary plan for your pet. -If you or your veterinarian have decided you should change your pets’ current diet. -Looking to do an elimination diet with fresh foods. Email Mary @ nutrition@k9clubhouseymm.ca if you have any questions prior to booking. This is a private classroom setting that is available onsite or Skype, to a small group of individuals or pet related businesses interested in learning more about fresh whole foods and pet nutrition. ​Mary Villemure is a passionate dog lover. She has spent years working directly within the pet food industry. Through her research and education, she is a strong supporter of a species appropriate diet for everyone but professionally for dogs and cats. 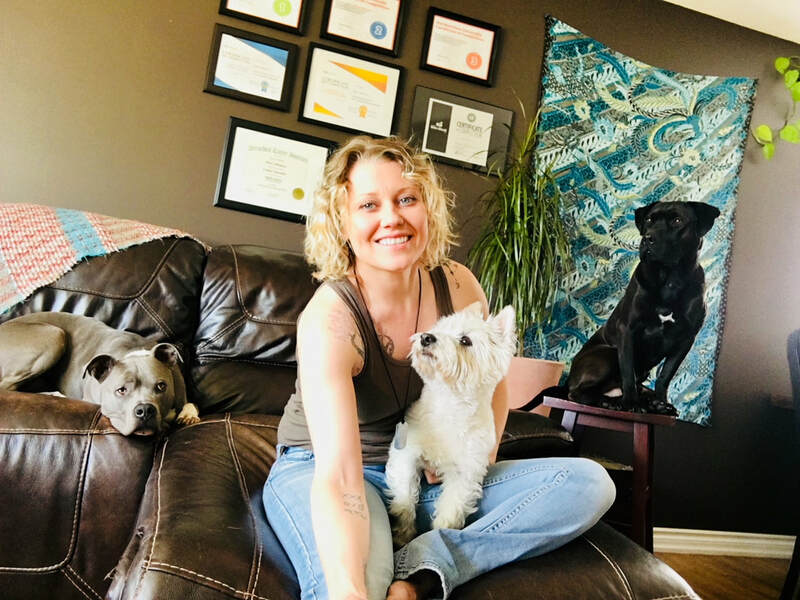 She is trained as a certified pet food specialist, an acute canine herbalist and a certified raw food nutritionist, along with a few other science based certifications. She is born and raised (23 years) on north Vancouver Island, but like many others, her six-month plan has lasted 7 years, so she considers Fort McMurray her home. She is so proud of her three fur kids that are all extremely healthy, happy canines. Maggie, her 9-year-old west highland terrier (the warden), Remington, her 5-year-old American Pitbull (the household cheerleader), and Kash, her 3-year-old Boxer Pitbull cross (the reason we have rules) all have their own nutritional (and behavioral) needs. She is so excited to be focusing on dietary requirements for your dog, whether that just be assuring your little friend is receiving a balanced diet or helping with some other common problems people face like recovering from illness or surgery, chronic urinary tract issues, gut health, weight issues, skin issues, joint problems, seasonal allergies (elimination diets), diabetes, as well all life staging feeding from puppies, lactating mothers to seniors-she’s passionate about fighting disease with food. Whether you’re new to raw feeding or just want to feel more confident when feeding your furry family member, she can provide a lot of assistance with an abundance of knowledge and she’s excited to walk down the path of healing with you. She believes in an all-natural approach and wants to be a part of your best friend’s journey to wellness.